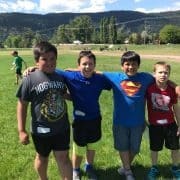 Looking for Things To Do in the Nicola Valley? 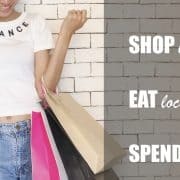 Jeanine Gustafson, owner of Vision Quest Optical and Gifts, encourages people to shop local in Merritt BC and support our businesses. That’s the message she would like to send out to the people who live in the Nicola Valley. 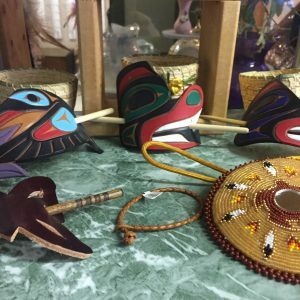 Vision Quest is an eclectic shop right on the corner of Quilchena and Voght Street, a corner everyone passes when they are downtown Merritt. Jeanine has a prime location on the main block, and fills her windows with a lively display all year round. 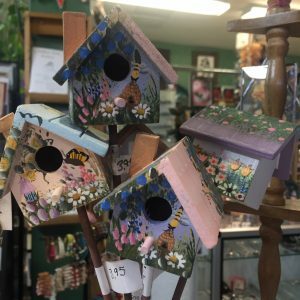 If you pop in to see what’s there, you’ll find jewelry, gems, glass frames, toys, cards, books and local art. On the Quest for Vision Services? 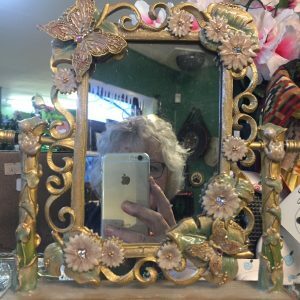 Glass Frames? Jeanine is an optician with 30 years experience and her shop began as a way for her to offer optical services to the people in the community. You can find a room full of diverse frames for children, women, and men in Vision Quest shop, and Jeanine can help you find a frame you like and fulfill your prescription. She offers one more great choice in the community before a person decides to head off for Kamloops or to online services. Definitely worth checking out! Over the ten years Jeanine has been providing options for vision care, she has expanded the offerings in her shop. 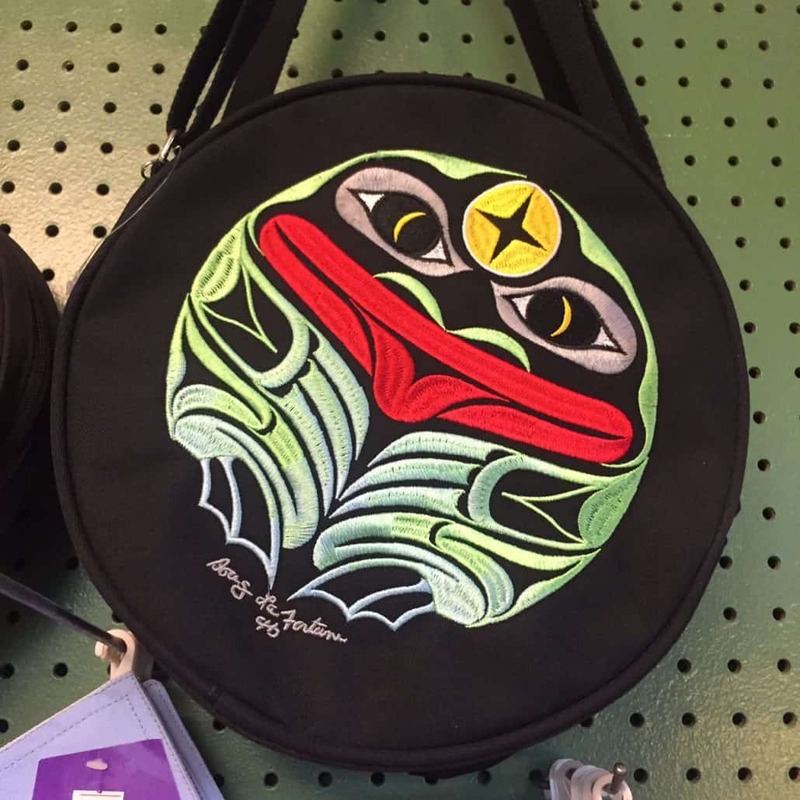 Vision Quest is full of art, crafts, and jewelry created by about 40 local artists. 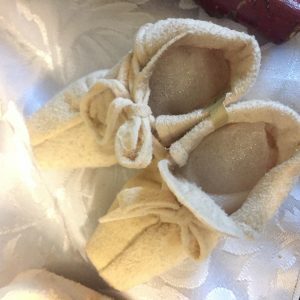 All year round there are gifts, mementos, and useful items to choose from: cards by Marilyn Lytton, blankets from Amelia Washington, handmade soap from Les Keys, baskets and beading from Charles McKay. 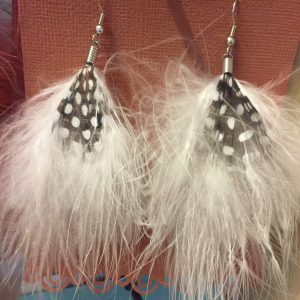 Jeanine herself creates feather earrings and other jewelry. 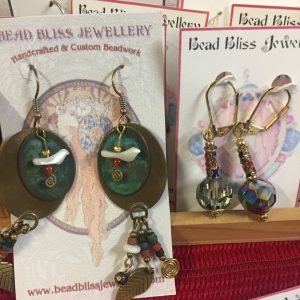 There are painted tiles and jewelry by Pauline Ouellet, cards by photographer Heidi Koehler, beading by Ashala Harvie. And beautiful pained rocks by local artist Georgina Beatty! The prices at Vision Quest are reasonable and range from about $5 to…more. 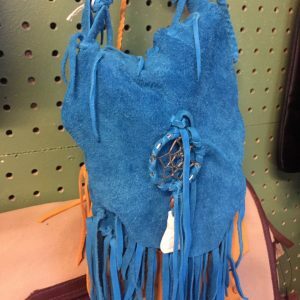 I was very taken with a gorgeous across-the-shoulder bright turquoise suede bag, for just over $100. 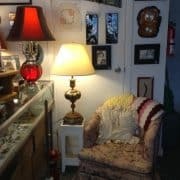 The local work in Jeanine’s lively, full shop is worth a leisurely search. 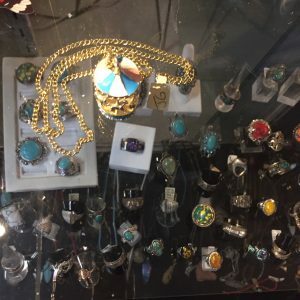 But I will admit that the jewelry, especially the gem jewelry, at Vision Quest often draws me through the welcoming doors on Quilchena Avenue. Jeanine’s windows are full of her jewelry, hanging or displayed in photo frames. And once you are in the shop, the jewelry is displayed in every cabinet, and in every nook and cranny. Amethysts, rose quartz, topaz, garnets, you name it. There are simple pendants to elaborately set jewelry, rings, earrings, bracelets in all shapes and colours. There is also a diverse assortment of costume jewelry and a variety of pretty bags for storing your gems and trinkets. And a good supply of beading supplies: seed beads, gem beads, and others, and lots of supporting items like thread. In my opinion, with years of experience in owning a retail business myself, ten years is a success story! Jeanine Gustafson is the owner of Vision Quest, renting her prime location from the local owners of the building. She has been open for ten years and is very familiar with what works downtown, and what doesn’t. 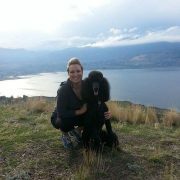 She talks about how she is supported by the City of Merritt’s policies and attention. Jeanine talks about other businesses and organizations which are supportive. For instance, she mentions how helpful the Open Door was to her. And comments on the support that Work BC has given to people she knows. Jeanine enjoys the people who come in. She has regulars who pop in for tea and chats. She serves a steady flow of people coming in for optician services. And she welcomes all the visitors to town who make their way through her doors. As we know, Merritt attracts people from all over the world. Jeanine often acts as an ambassador and tells people where to go in town, and what is happening locally. She has stories she shares with visitors, things I didn’t know about the history of some of the surrounding buildings and I’ve lived here for a lot longer…. the Christmas windows! Jeanine possesses the considerable Christmas village collection of the late Marguerite Kempin, a long time resident of the valley. It takes Jeanine a month to set it up, with no days off! And it will take a month to take down, ready for the next display! So it was great to hear that is a favourite part of her shop experiences. I enjoy the Christmas window! And I know others who do too, some who take their grandchildren downtown to view it all. Have you seen it? Whoops, it may be too late for this year. But the next display in Vision Quest’s display windows, on the corner of Voght Street and Quilchena Avenue will be there soon. Stroll by! Pop in! Vision Quest is open Tuesday to Friday 10am-6pm, Saturday 11am-5pm. Closed Sunday and Monday. But Jeanine is open on Mondays in the summer months. She says Monday is a busy day in Merritt in the summer! Now that’s a positive message that supports all the shops in Merritt! And if you want to see more local art visit our local Arts Gallery at the heritage Courthouse on Nicola Avenue. 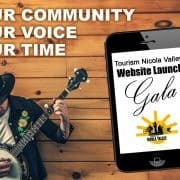 And visit our Nicola Valley Arts Council site, to see what’s happening in the arts in our valley. 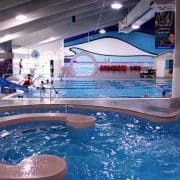 The NVCAC is also on Facebook. And check out my Creative Community Facebook page.